This week I’ve been unproductive and procrastinating. Blah is never a good feeling. It could be the chilly weather and lack of daylight, it could be my recurring insomnia, my weird vivid dreams when I do sleep (I need to get a dream interpretation book) or it could be something else all together. Other than assembling a blanket fort and watching Netflix, what brightens up my day is making and eating (that’s the best part) food and drinks. After all, I do run a food blog. It’s even better if it’s healthy, quick, and easy! 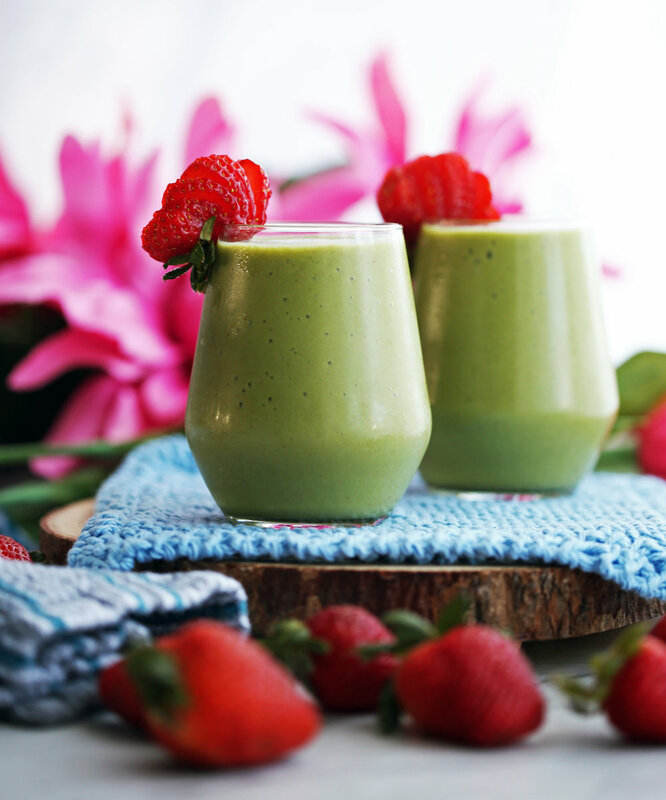 This Strawberry Avocado Green Smoothie did just the trick! Plus, it gave me the energy to write this post. This smoothie only has five ingredients! - six if you decide to use a sweetener. Fresh strawberries: sweet and tart with bright citrusy undertones. It’s good for you! It has tons of antioxidant and anti-Inflammatory benefits and is high in vitamin C, fiber, and manganese. 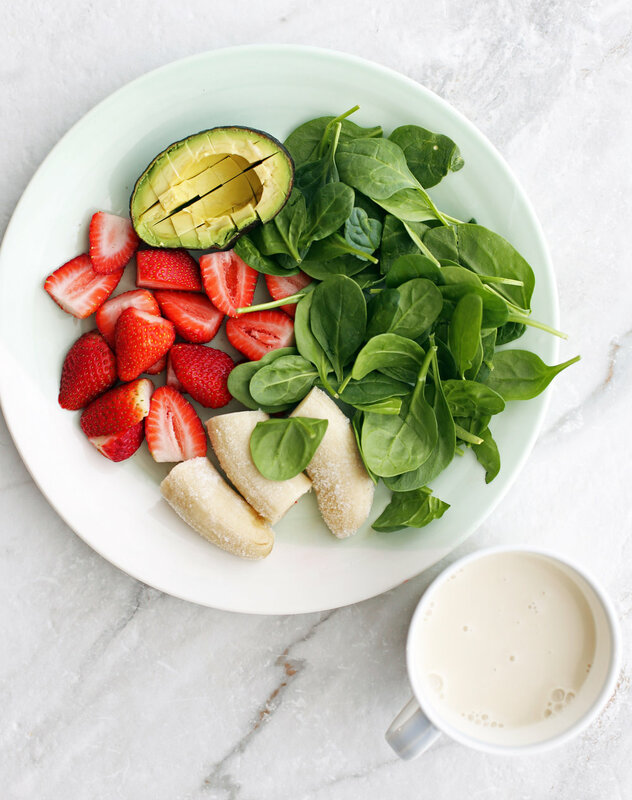 Select strawberries that are bright red, firm, and plump with fresh green leaves attached. Also it’s preferred to buy local and in-season; they are not in peak season (April through June) right now (this post was made in mid-January), but they are almost always available at the supermarket. Fresh avocado: buttery in flavour and texture with nutty notes. It has health benefits: high in healthy fats, fiber, full of vitamins and nutrients like vitamin K, vitamin C, and folate. Use Hass avocados (also commonly misspelled as Haas or called “alligator pear”): they are smaller, have pebbly skin that’s dark green to almost black, and have more flavour than Florida avocados. How do I know an avocado is ripe? The skin turns from green and firm to a purplish-black and will “give” slightly when pushed with gentle pressure. A green avocado might take 4-5 days at room temperature to ripen. Fresh baby spinach: mild, clean flavour with soft, tender leaves. It’s what gives the smoothie the lovely green colour! High nutritional value! It’s full of antioxidants and especially high in vitamin K and magnesium. Look for spinach leaves that are dark green and crisp. Avoid yellowing and limp leaves. Frozen banana: sweet with a firm, creamy texture. Use a ripe banana: a ripe banana (bright yellow to many brown spots) is sweeter than a green one. Fun fact: they are many varieties of bananas, but the most common type that we eat (the yellow one) are called Cavendish bananas. Also, there are wild bananas that have big, hard seeds in them. Weird. Remember to peel the banana before freezing. It is a pain to peel a frozen banana, believe me. Unsweetened almond milk: creamy, nutty, and dairy-free. It’s helps thin out the smoothie as the avocado and banana makes this drink thick and creamy. Maple syrup (optional): It has a nice rich sweetness that goes well with the other ingredients. You can substitute with another sweetener if you like though. I hope you enjoy this recipe! If you make it, please let me know what you think by commenting below or through any of my social media. Once blended, taste and adjust according to preferences such as adding more strawberries for a stronger strawberry flavour or maple syrup for additional sweetness. Substitute the almond milk with a different milk of your choice if you like. Nutritional calories represent one serving with two servings total.